Thirteen months ago, I cooked my first Thanksgiving dinner. I was daunted by the task, so I made extensive lists with start times for each dish. I dried out some bread crumbs for stuffing and am slowly thawing out the free range turkey breast in some water in the sink. In the fridge, I'm thawing green beans, corn, summer squash, apple cider, and chicken broth (for the stuffing), all homemade. Of course, the hardest part is yet to come --- making the trailer and yard presentable for visitors! That's an impressive meal--and far more impressive that you're serving a sugar free cranberry pie! How'd you do it? 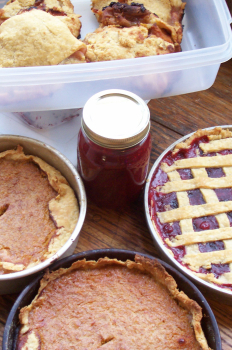 I'll have to write up the recipe for the cranberry pie --- it's quick and easy and delicious! The sugar-free part just means it was made with honey.